With 2018 behind me, I can honestly say it was one of the biggest years of growth I’ve ever had in my personal life. There were many challenges and many victories. At times it was stressful, but that’s life… a series of stresses and moments of beauty. This past year I went through a drastic relationship change, I faced tough financial decisions, succeeded in business, worked a LOT, hit one year on testosterone and one year post op top surgery, had my name legally changed, and made incredible strides in my bodybuilding. The highlight of my year when it comes to River Runs Wild was launching the 12 Week Beginner Bulk Program, my first ever training program to share with others. It means so much to me to share the methods that allowed me to grow in both mind and body. Going forward into 2019 with this plan available fills me with true excitement and I can’t wait to learn from others experience’s with the program. Below are the posts from 2018 that received the most visits. They are a snapshot of this past year in my transition, bodybuilding, and self development journey. They are an honest look at what I love to share with others. I hope that they can be resources that give others support when they need it that most. This post highlighted a typical day of my Plant Based Diet while bulking to gain muscle mass and size. The more I tweak and adjust my diet, the more I feel like I am able to meet my macros easily. I ate more protein than EVER in 2018 and was able to do it avoiding animal sources. I’m hoping to bring several more of these posts to the blog in 2019! Excerpt: This post shows a typical day of eating for me on my current bulking diet. My current diet is plant based and vegan. No meat and no dairy. My meal plan and macros are based off my goals of putting on 1-1.5 pounds a week of mass (mostly lean mass but fat is inevitable). These calculations are based on weekly weigh ins and my macros are adjusted according to the weight I'm gaining. The kindness and feedback I’ve received about this video mean a lot to me… I’m glad that my story can provide others with motivation and hope. Making it through that first year was such an incredible transformative process, it needed to be shared. Excerpt: This video recaps my first year of transition through clips from my video journal series. I talk about the incredible experience of this first year on testosterone and show my FTM transformation. I’m so glad that people are finding these great scar care tips! These are the methods and items that I used while I was recovering from top surgery and the early months of being healed. I share this post often with anyone who is looking for scar care advice. Excerpt: After care is vital to healthy healing and feeling your best. 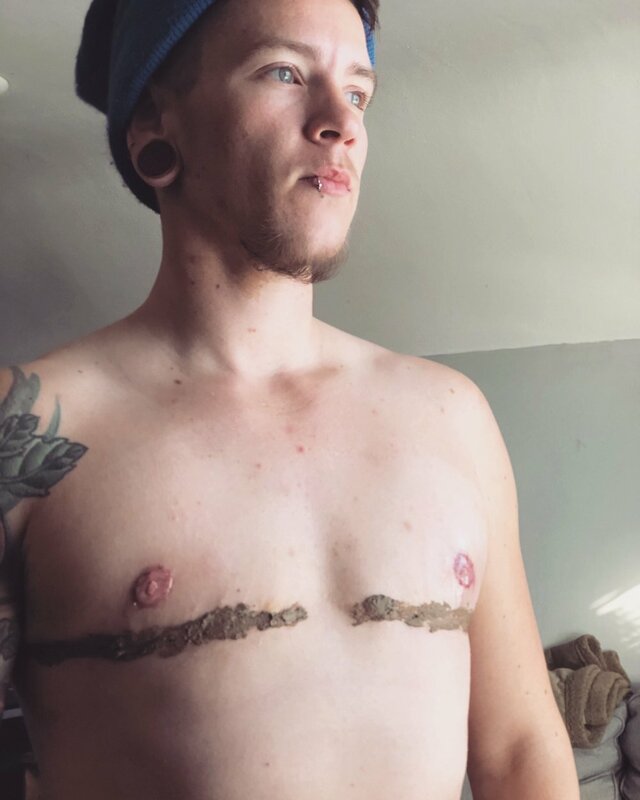 In this post, I discuss my scar care methods for post op top surgery care. These care methods mostly apply to once you are at about 2 weeks post op and beyond. Shoulders and Arms are areas that I am always looking to figure out new ways of training. This workout is a beauty! It hits every portion of your arms and shoulders for an overall pump that will leave you feeling powerful. Excerpt: This workout is a mass builder. For my second 12 week bulk of 2018, I used this workout to help increase the width and size of my shoulders along with strengthening my arms. This workout puts emphasis on the triceps to put real size on your arms. It hits the biceps but the focus is not definition but overall mass building. This workout is best done twice a week as part of a 2 body part split. My legs and lower body continue to amaze me. The legs gains you can experience as a beginner and intermediate lifter are crazy. In 2018, I put 115 lbs on my squat. This leg workout was used for part of my 2018 training year. Excerpt: This workout is a serious size and strength builder. For my second 12 week bulk of 2018, I used this workout to help increase the strength of my legs and improve the appearance of my lower body. This workout puts emphasis on two major compound movements, the squat and the leg press, to make you go heavy. It hits the quads, hamstrings, and glutes in a big way. This post shows you how to make the scar care mask that I used for several weeks during my early top surgery recovery. I love this mask. It pulls out toxins and keeps the area healing. It’s also calming and soothing to new skin. Excerpt: I developed this mask after top surgery (double mastectomy) to help my body detoxify, reduce inflammation, minimize redness, decrease puffiness, and do all I can to help minimize the chance of having dark scars on my chest. The ingredients are all chosen for their natural healing properties. The mask is gentle, safe, and easy to make! This is the first Q&A I’ve ever done, so I’m glad it made the top 10! I was in kind of a slump when I made this video and answering everyone’s questions really lifted me up. I’m fortunate to have had so many wonderful interactions with people from all over, even if they are brief - they have provided me with a lot of positive energy. Excerpt: I requested that people ask me questions on social media and you all delivered! Thanks to everyone who reached out and sent me a question. I had fun filming this one. I hope you enjoy it. I’m still on this quest! I’ve made core training a part of my training that I never skip. It is a stubborn area for me and is taking much longer to develop than I first thought. But, I continue to make improvements and things progress. Excerpt: After implementing this workout and some key changes, I now know I'm on the right track to ab training. My abs have started to feel sore like my other muscles groups. I get out of breathe while training them and I am sweating during the workout. I finally feel like I'm actually making some progress on my core! These are two of the areas that I saw BIG growth from in 2018. I went from a small t-shirt, to a medium being comfortable, to a medium being tight! It’s all because of the size of my back and chest. Excerpt: This workout is a mass builder. For my second 12 week bulk of 2018, I used this workout to great increase my overall chest and back size. This workout is best done twice a week as part of a 2 body part split. It’s wild how fast time is flying by in my transition. Hitting one year seemed so far off… then it arrived. A year and a half seemed so far in the distance. Now, I’m only 2 months away from 2 years on T! It’s amazing what can happen once you take the plunge, face your fears, and do something for your well being. Excerpt: This video recaps the last 6 months of my transition (from February 2018 to August 2018). I go over physical changes, medical updates, life updates, and a general catch up on what I've been up to! So there they are! The top ten posts of 2018. I'm so grateful for everyone that has stopped by my blog. It's a very personal little space I've carved out online and allows me to share my life with others. If you are new to the site, stop by the About Page for a better rundown of how River Runs Wild got started. More posts to come! For video updates, subscribe on YouTube. Follow me on Instagram and Facebook for more frequent updates. Thanks for joining me on this transition journey. Please feel free to leave a comment or browse the other sections of the blog. My goal in sharing my experiences is to provide personal information to anyone seeking out advice on gender transition, mental health, and wellness. People's personal stories have been a huge inspiration and source of information for me, I'd like to pay that forward. Please feel free to contact me if you have any questions, comments, or just need a sound board.